In 1986, the Barber-Greene Company was acquired to augment the product line. At that time, Barber-Greene was a major producer of pavers, milling machines, trenchers, crushers and asphalt plants. 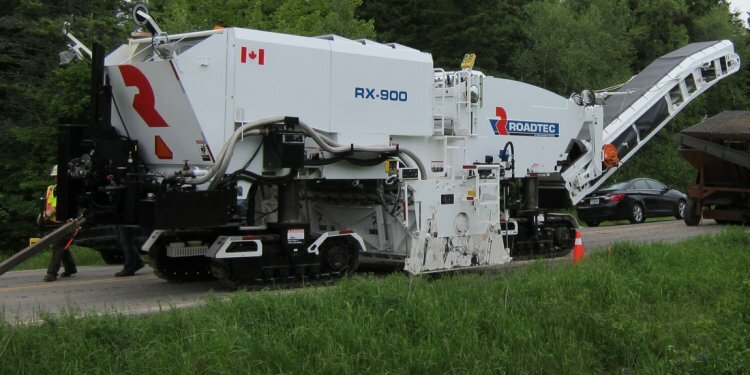 With the combined technology of Roadtec and the Barber-Greene Company, the paver line continued, along with the milling machines, and the concept of the material transfer vehicle was born. The first material transfer vehicle was the MTD 3500. The Barber-Greene paver line was sold to Caterpillar in 1991 and Roadtec reorganized in Chattanooga, Tennessee to manufacture and market the entire line of road building equipment for Astec Industries. This included asphalt pavers and milling machines. It was around this time that the smaller, modern day Shuttle Buggy® material transfer vehicle evolved from the larger MTD 3500, rounding out the product line. Today, Roadtec offers an extensive line of pavers that are the most reliable and maintenance-free pavers in the industry. They are simply designed and well balanced for maximum tractive effort and can be equipped with a variety of screeds, all with electric heat as standard equipment. Access to major components in Roadtec’s pavers is unmatched by competitive brand machines. Roadtec was the first manufacturer in the industry to install an FXS™ fume extraction system as standard equipment on all of Roadtec’s pavers and Shuttle Buggy® material transfer vehicles. Roadtec’s new Comfort Drive™ operator system embodies the latest in ergonomic design, provides greater visibility, fingertip controls and is also standard equipment. Pavers are available in rubber-tired, track or rubber-track models and come in either 8- or 10-foot paving widths. We also manufacture the patented Stealth™ gravity-fed paver which eliminates the need for hopper wings, conveyors and tandem front bogies. Roadtec produces a full line of cold planers in sizes from utility to full-lane. These cold planers provide the optimum balance between horsepower, production and maneuverability. Track models can be equipped with a bi-directional feature (some come standard) to achieve down cutting with rear discharge of material. Hydraulically-raisable engine hoods allow easy access to the engine compartment which is heavily insulated for superior noise reduction. Variable width cutters and attachments for side cutting, available on some models, make Roadtec cold planers the most versatile milling machines available. Roadtec offers the latest in pavement placement technology available worldwide with its Shuttle Buggy® material transfer vehicles. These machines are self-propelled transfer devices with unique anti-segregation systems that remix asphalt material to produce a consistent size and temperature. The industry-wide problem of asphalt segregation is eliminated. Continuous, nonstop paving is allowed by separating truck unloading from the paving process. With the new harder-to-lay superpave mixes and overall tougher specifications for roads, the qualities of Roadtec’s material transfer vehicles make them a necessary item in the new fleets of today's contractors. Roadtec has become a highly successful company by being committed to the industry to produce innovative, high quality equipment and unequaled parts and service support. Would you like to be part of the exciting group of people that make and sell Roadtec products? Our company’s core purpose is to improve the quality of life for people all over the world by building equipment to improve the world’s infrastructure. We accomplish that through the dedicated associates who work at our company. The people who work for the Astec family of companies are the most talented and dedicated people in the industry. Safety, profit and rowth as the primary means to ensure the success of the company. We invite you to learn more about Roadtec, Inc. and what it has to offer prospective associates. If you join our company, we feel that you will have a rewarding career in a work environment where you will be challenged daily, while being respected and valued as an individual and as a part of our team.